With all the chaos going on in the world right now, it’s important to think about creating some DIY booby traps for the home. Because lately it’s seemed that the world is going to hell in a handbasket. Policemen are being shot, terrorist attacks are happening right and left, and the people of our once great nation are turning against each other right and left. And it doesn’t seem like things are going to get better anytime soon. 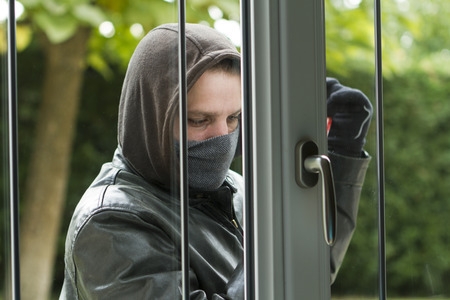 In the midst of all this mayhem, it’s important to know how to protect your home from intruders. After all, it won’t be long until attackers are not only coming after our nation as a whole, but are coming after our homes and after our families as well. You can protect yourself, your family and your possessions by building some DIY booby traps. I’ve got some cool information and videos about which ones to build so you know exactly what you need to get started. 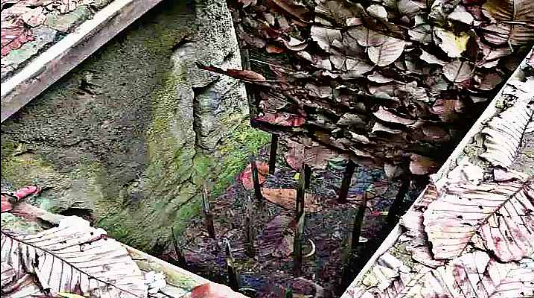 Now keep in mind I’ve included several types of booby traps in this article. Some are to give the guy/gal a warning, and others are meant to do serious physical harm. You can pick and choose which ones are right for you and your situation. Note: Most if not all of these traps are illegal, so user discretion is advised! These are mere examples of what you might have to do if SHTF. 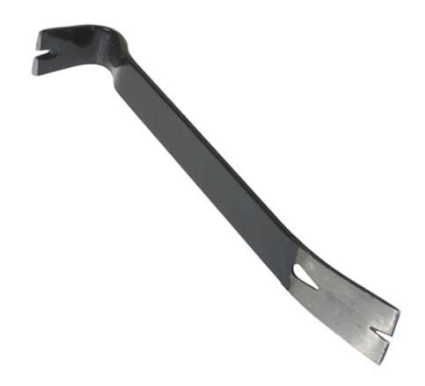 Now before you start learning about booby traps, there’s something you need to do first – and that’s have a foolproof method of proving the attacker actually trespassed on your property and/or tried to hurt you. All of these booby trap ideas will be worthless if you can’t prove the attackers were on your property to start with. The perpetrator can easily lie and say they didn’t do it (or that it was someone else), and in a court of law your word will mean nothing without evidence. To prevent this all from happening and to make sure your attacker is persecuted to the fullest extent possible, you’ll need our BRAND NEW Aura Plus Digital Vision Monocular to help you. This survival tool is truly incredible. Because it uses high-quality, high-tech digital night vision, this monocular allows you to see clearly and crisply in the dead of night using a top-notch black and white LCD display. 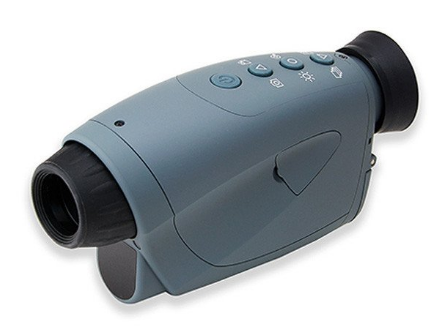 Unlike traditional night vision monoculars, this one uses the latest technology – which means there’s no blurry green screens and no annoying intensifier tubes. The other amazing thing about this Aura Plus Monocular is that you can take pictures AND video with it, whether you’re in daylight or pitch black darkness. So if an intruder comes sneaking around your property, it won’t just be your word against him, but also pictures and a video showing footage of the entire crime. If an attacker comes snooping where he/she doesn’t belong, they’re going to deserve what they get. You can ensure justice is served by using the Aura Plus Digital Vision Monocular. Click here or on the image below to prepare now for your next attacker. This is a great, affordable booby trap that is easy to set up and easy to execute. Simply place these trip wires around the perimeter of your bug out shelter/house to alert you of an attacker. Here’s a video from NeoPrepper explaining which one to buy. Here’s a trip wiring system that packs a bit more punch than the one in #1. Check out the video to see this awesome booby trap. 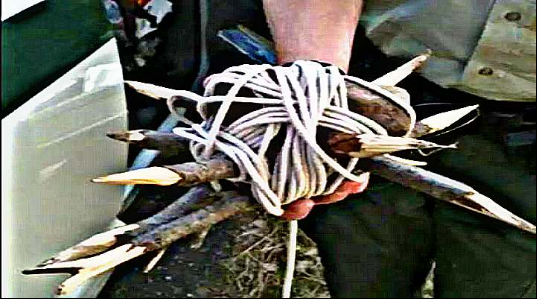 If you’re looking for a more abusive approach, you can utilize the trees around you to build this swinging log trap. Attackers won’t know what hit them – literally! See detailed info on how to make this trap below. Now keep in mind the video below merely portrays a (mostly) harmless prank – however, you can use your imagination on how to tweak this for a real attack. P.S: If you’re not planning on using this method, it’s still funny to watch! This one was also done as a prank – however, you could easily make this happen in your home. When an attacker comes knocking, they’ll get a real shock when they try to open the door! If you’re looking for a lethal weapon to protect your home, look no further than the Spike Ball. 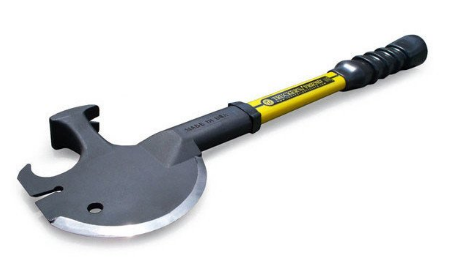 Using just three simple tools you can make an intruder wish he/she had never stepped foot on your property. Once the ball is built, hang the ball to a high tree branch, and connect it to a trip wire. Once the trespasser trips the line, the Spike Ball will come down swinging. And, even if it’s not a direct hit, they’ll certainly think twice before taking another step. This is one of those traps for when things really go south. You can build/dig a pit, and insert spikes at the bottom. Place these Spike Pits strategically around your home/shelter, and make them as large or small as you wish. Just make sure you don’t fall in! Now most of us have seen this gag – an unsuspecting intruder steps on the business end of a rake, and the pole smacks him/her in the face. However, this tactic could work surprisingly well in a survival situation. Lay these rakes around your property, and make sure you don’t have any lights around them. If it’s dark enough, it’s likely the attacker will step on at least one of these. And, if he/she steps on it hard enough, it can easily cause a concussion. Most of us have seen the bucket of water over the door prank – however, you can upgrade this booby trap if you’re in a survival situation. By filling the bucket with dangerous chemicals, you can do some serious damage to an attacker trying to get in. This video is of a harmless prank on a boss, but you get the idea. You know those clear plastic mats you find under office chairs? Flip them upside down, and you’re likely to find sharp spikes that hold the mat in place on the ground. Place these upside down mats around the entrances of your home/shelter (both inside and out), as well as in hallways and around corners to help protect you. Intruders won’t be expecting to step on these when they’re walking around in the dark! Now I recognize that most of the videos in this blog were of (mostly) harmless pranks people have played on each other. However, it’s important to remember that attacks are not a laughing matter, and it’s up to YOU to do what you need to do to protect your home in a SHTF situation. Survival Frog cares deeply about you and your family’s protection and safety. That’s why we have a bunch of self-defense tools you can use to defend yourself with if you’re being attacked. After all, at the end of the day, your safety is in your own hands. How well you choose to prepare for an attack is up to you. 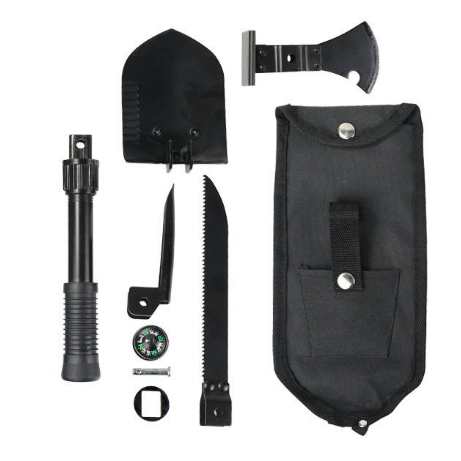 Click on the images below to snag some of these survival tools to protect yourself and your family today. 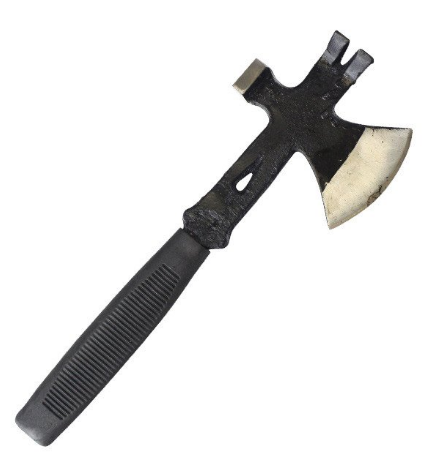 Note: Need more ideas for self-defense weapons? I wrote a blog about some unusual (but effective) weapons you can use. See it here. This entry was posted in Family Survival, Self Defense, SHTF, Survival Hacks, Videos and tagged DIY, DIY Survival, diy survival tools, self defense weapons on August 25, 2016 by Survival Frog.